Love was in the air when we disembarked that afternoon at Punta Espinoza on Fernandina Island. Earlier in the day we had seen several pairs of sea turtles mating at different times. One fellow traveller remarked it was no wonder the sea turtles were endangered because we kept disturbing them. 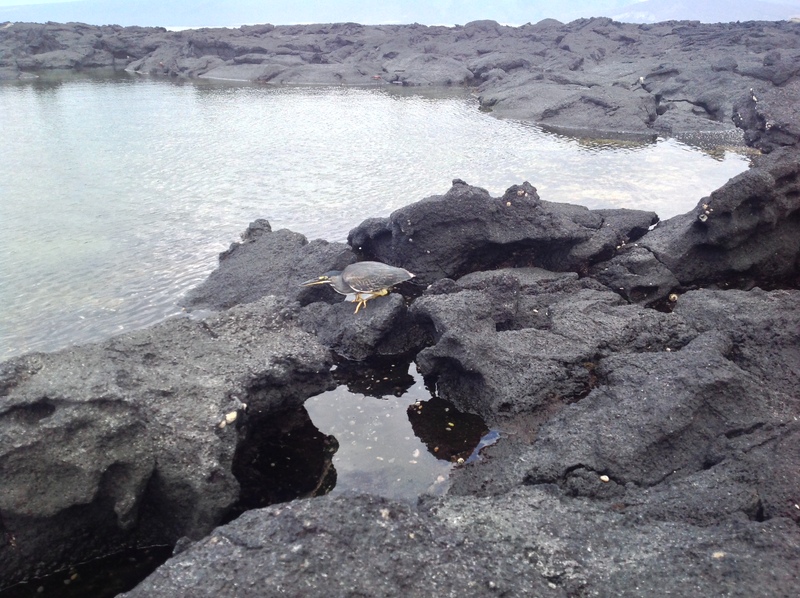 Within minutes on the new island I saw a Lava Heron fishing near the shore, a sea turtle missing a flipper, and a pair of Sally Lightfoot crabs mating in the rocks. 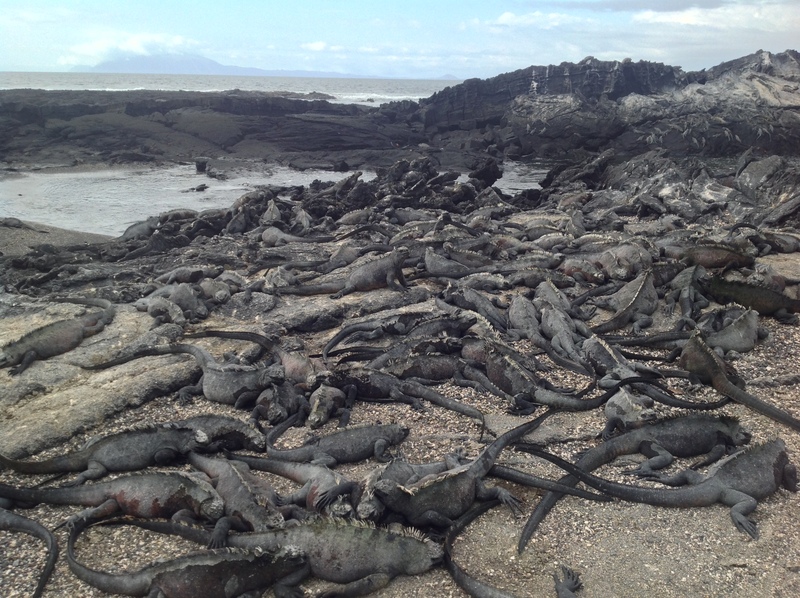 I lifted my head up from all the action on the shoreline and was amazed to see hundreds of marine iguanas lazing in the sun draped haphazardly across the hardened lava. Lizard City – even though these are all technically iguanas. Along the trail a female Lava Lizard raced by with her tail held high, signaling to the males she was ready for action. A short time later we saw marine iguanas mating. It seemed pretty violent. The marine iguanas might look harmless because they don’t move much and have a vegetarian diet, but their mating rituals left me with a different impression. I missed seeing the flightless cormorants mating, but turned around in time to see them building a seaweed nest together in preparation of the eggs. 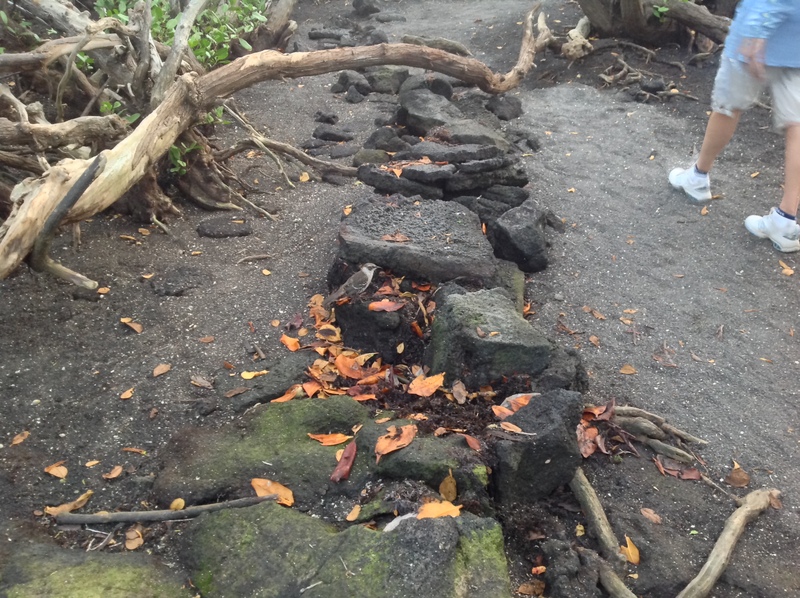 We continued our walk across the expanse of lava into a mangrove complete with red, white, and black varieties. A Galapagos Snake lay motionless in the sun, blending seamlessly into the rocks. 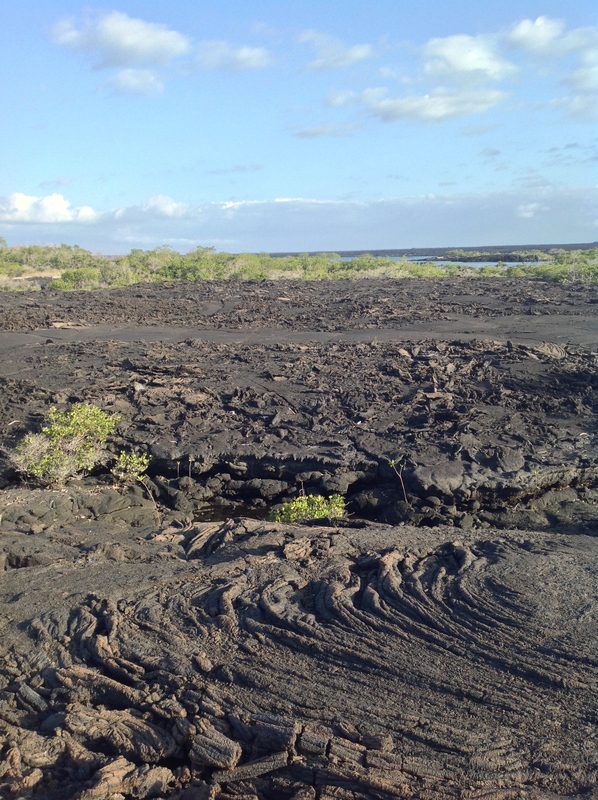 Looking across the terrain, composed of tumbled, swirled lava budding with fresh, green mangrove shoots, was again like travelling back in time. This was the beginning. Expanse of lava on Fernandina. Sprouting in the cracks we saw three different species of mangrove and cacti. We took a few moments to relax at the edge of a brackish lagoon, watching sea turtles swim around lazily and tiny fishes slurping algae off the rocks near our feet. A few feet away a small sea lion snoozed peacefully on the rocks. Scattered on the rocks were more marine iguanas, barely moving and sometimes difficult to avoid stepping on since the muted tones of their skin often matched the stones. Trekking back across the lava field to leave I could see time racing forward. The mangroves thickened and became denser, forming a canopy protecting me from the late afternoon sun. I spied a Galapagos Mockingbird, one of the first species that got Darwin thinking, before boarding the panga back to the boat. Absolutely amazing. I can’t believe all this exists in one area. Was hoping to see some pictures of sea turtles, I love them so…and the lagoon. I’m such a photo hound. Muah!